I am an Associate Professor of Physics (and former Associate Provost) at Alma College in Alma, Michigan. Previously, I was a Visiting Assistant Professor of Physics at the Joint Science Department at the Claremont Colleges (serving CMC, Pitzer, and Scripps). I got my Ph.D. in Physics at the University of Chicago, studying string theory under Jeff Harvey. As an undergraduate, I majored in Physics and Math at Harvey Mudd College (also in Claremont); my thesis there was on general relativity. For those who are interested, my current CV, statement of research interests and proposed undergraduate student projects, and teaching philosophy statement are available in PDF format. As described on my research page, much of my work in string theory has related to non-perturbative effects. I have a strong interest in non-geometric coordinates and symmetric approaches to T-duality. In a project with Jeff Harvey, I studied non-geometric corrections to the Kaluza-Klein monopole in string theory induced by worldsheet instanton effects (published informally in arXiv:hep-th/0507204 and in the Journal of High Energy Physics as JHEP10(2005)028; I have also written an overview for non-specialists). More recently, I have related those results to Hull's "doubled geometry" formalism (published informally in arXiv:1106.1174 and submitted to JHEP, with its own summary for non-specialists). In an unrelated project with Eduard Antonyan, Jeff Harvey, and David Kutasov, I studied chiral symmetry breaking (specifically, a non-local analogue of the Nambu-Jona-Lasinio field theory) using string holography (arXiv:hep-th/0604017). Both of these topics suggest fruitful directions for further work, and I am interested in a variety of other topics in M-theory and string theory as well. I also have an interest in physics teaching and outreach. I have often taught an algebra/trigonometry-based general physics course aimed largely at biology majors and premedical students, sophomore classes on electromagnetism and "modern" physics, and junior/senior level courses on quantum mechanics, electromagnetism, and thermodynamics/statistica mechanics, along with an occasional course on medical physics. Although my focus in graduate school was on research, I found opportunities to teach there as well: in addition to occasional duties as a TA running lab and discussion sections at various levels, I was asked to lead review sessions for students preparing for the Ph.D. candidacy exam and for the physics GRE. 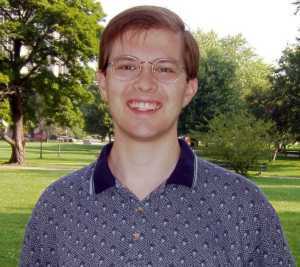 Asn an undergraduate, I was a popular (volunteer) physics tutor for students at all levels. As for outreach, in 2003 I gave a brief speech on the value of science at the Chicago ARCS Foundation annual scholarship luncheon; the text is available on my personal site. The ARCS luncheons and other activities of the Foundation also gave me the opportunity to present posters describing my research to non-scientists many times over several years. In 2004, I gave a talk to the Chicago chapter of the MIT alumni club entitled "An Introduction to String Theory", and in addition to various job talks I have given an invited colloquium "Extra Dimensions in String Theory" at Cal State-Northridge and a variety of talks at my own institutions. Finally, on the web, my teaching page includes tutorial articles on various topics; my Lagrange multipliers tutorial in particular seems to be rather popular. As mentioned above, I also try to provide descriptions of my research that are accessible to non-physicists. And a little less academically, I've also written a list of surprising life knowledge that I call "Wow, Good to Know!" Finally, I've made a nice poster of the planets to scale for the Alma planetarium. My personal site is also available. Copyright © 2005-17 by Steuard Jensen.